I'm visiting my dad at the nursing home today. He's sleeping, so I'm posting an update. Still trying to find better internet service at home - one that's fast enough to do more than read e-mail. Our cold spell ended yesterday, but there's another forecasted to move in on Monday, an even colder one with temperatures stuck in the freezing zone all day for several days. Yuck! I hope it doesn't do this all winter, but just in case, I'm trying to set up a sewing area in my mom's house so I can at least work on small projects. And I need to make my dogs some jackets to wear when it gets so cold. Doggy sweaters don't work with them as they can squirm out of them faster than I can put the sweaters on them! In past years, I made cotton ones (non-stretchy fabric) lined with flannel. This year, I might try fleece as the lining. For Dusty, I should try to find some denim for the outside instead of cotton - his big paws shred cotton fabric too easily. The old quilt I have an my bed looks like someone tried to feed it through a paper shredder! I'm still having internet troubles at home with my dial-up service, so I'm in town at my sister's using her dsl to access my blog and upload several posts at once. Winter weather has arrived here, with nighttime lows dipping down to the low 20's. It's been much too cold to work in my studio or in my trailer, so I've been sort of camping out at my mom's house. To keep myself busy, I've been crocheting snowflakes. I wish you could see the sparkly silver thread in the white yarn. These will make pretty tree ornaments. The patterns are from the book 100 Snowflakes to Crochet by Caitlin Sainio. The snowflakes in the book were made with crochet thread, but I'm using #4 weight yarn and an H crochet hook -- my snowflakes come out about twice the size of those in the book but still only 4-5" in diameter. 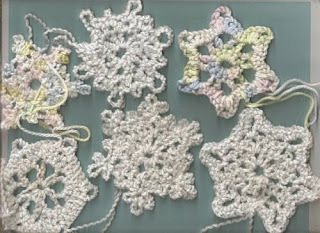 Half my snowflakes are made with the white holiday yarn, while the others are made from a variegated pastel baby yarn. We're supposed to have another week of this icy cold weather, so maybe I'll get enough snowflakes done to decorate with and give as gifts. But I'd rather be in my studio sewing. In case you're wondering why I'm not hand quilting something, I have a 20-pound dog who thinks my lap belongs to him. I can crochet above him, but any craft involving sharp needles is out of the question during the winter unless I'm sitting at a table. During the warmer months, he's too busy playing outside to care about my lap. 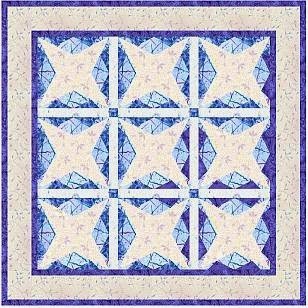 When you put multiple Snow Star blocks together, you get a kaleidoscope effect with a secondary star that seems to float behind the white star. The image above shows a setting without sashing. 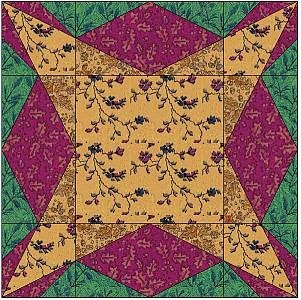 When you add sashing and cornerstones, you create a a more complex secondary star image, as shown below. Changing the use of fabric colors in the sashing and cornerstones will also change the design. 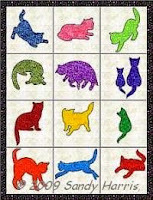 Wouldn't this be a pretty quilt for displaying a collection of snow people? Tired of blue and white? 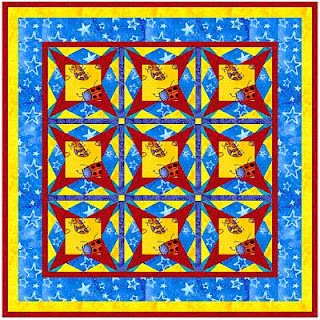 Here's what a child-sized quilt might look like using bright kid prints. 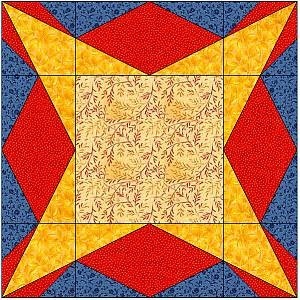 The newest issue of Quiltmaker's 100 Blocks (vol. 8) went on sale a few days ago. 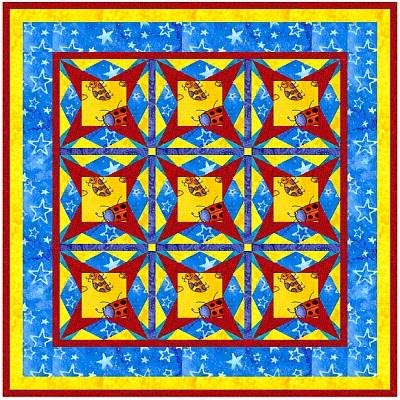 It's full of incredible pieced and appliqued blocks! 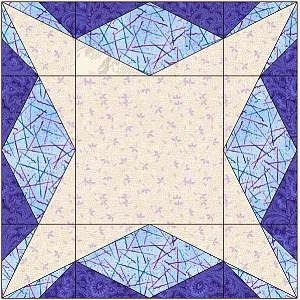 My pieced block, Snow Star, is a bit of a Plain Jane compared to the others, but you can make some pretty incredible designs with it. 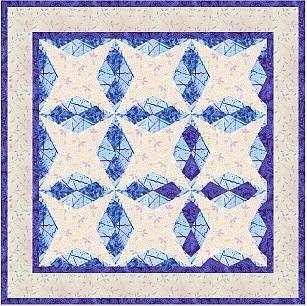 For the magazine, I chose to do this block in three shades of blue, similar to the virtual block above (I no longer have the block that I submitted). 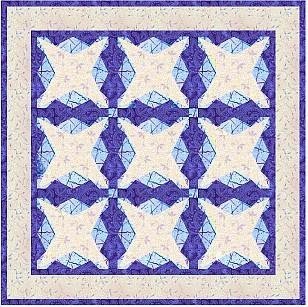 After naming it Snow Star, it was a little difficult to visualize this block in other colorways, but I persevered and came up with the two below.